THE WADE KROUT TEAM - We're Here For You! 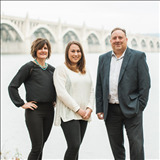 Meet the members of the Wade Krout Team...over twenty-five years of continuous experience with hundreds of real estate clients throughout the Central PA region - what more could you ask for? Wade understands the importance of building long-lasting client relationships based on trust, information, and the delivery of results. He is a dedicated professional who demonstrates the highest quality of work, attention to detail, follow up and excellent communication skills. The purchase of a home is a significant business transaction that must be continually nurtured and monitored and Wade is equipped in all areas to evaluate a property's highest potential. A life-long resident of York County, Wade is committed to helping buyers and sellers consistently exceed their expectations by creating a unique real estate experience. Wade is also a CDPE designated agent and has extensive training in helping homeowners avoid foreclosure. He believes that quality, blended with excellent service is the foundation for a successful business relationship. Who can you trust to help you navigate the craziness of finding the perfect house and making the right financial decision for you and your family? You don’t want a REALTOR® who doesn’t have your best interests as their topmost priority. So, who do you trust? While buying a house can be a nerve-wracking experience, Jenn Mackie also believes it can be a lot of fun. The key is working with a REALTOR® who is working hard for you to help you make the best decision possible. So, when you’re looking to make one of the biggest decisions you’ll make – whether it’s your first home or a moving on for a different phase of your life, let Jenn help you find what’s best for you. With the power of the Wade Krout Team and Coldwell Banker behind her, Jenn is ready to deliver the best service and marketing...for your benefit! When you are ready to learn more about buying or selling a home, Mckenzie is here for you!